The European otter (Lutra lutra) is a focus for conservation efforts throughout Europe due to a population decline in recent decades and because of its importance as a biological indicator of the health of rivers and waterways. The aim of this study was to aid the conservation of this species by adding genetic information from samples originating in the United Kingdom (UK), to help build up a picture of the phylogeographic structure of the European otter throughout Europe. This was done by a comparison of 299 base pairs of the mitochondrial DNA control region. Four haplotypes were identified in the UK, one of which has not been found outside the west of the UK in the wild, and one of which was unique. Populations in the UK, and in particular the west were shown to have a higher haplotype diversity than previously found for the European otter in Europe (h = 0.7338 for the 58 UK otters sampled in this study) and an overall nucleotide diversity of π = 0.003. The western UK population was shown to have a high level of genetic distinctiveness. 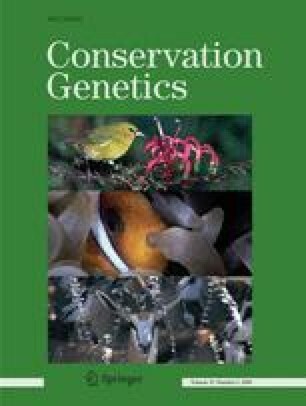 We discuss possible contributory population processes, the importance of the western UK population for the future conservation of the species and comment on future conservation strategies.